TVM is informed that a care order is to be issued for Cristiano, the baby boy abandoned yesterday on a porch in Bugibba. The baby is presently still at Mater Dei, but will eventually be taken to the Ursoline sisters. Magistrate Joe Mifsud, Inspector Godwin Scerri and the FSWS are currently coordinating on the situation. Mr Steve Libreri from the Child Protection Unit has been appointed to assist in the inquiry. TVM is also informed that if the mother is identified, she will be provided with every assistance. Sergeant Glen Carabott, who hugged the baby to him when he picked it up from the doorstep, thanked all those who had shown an interest in helping it. 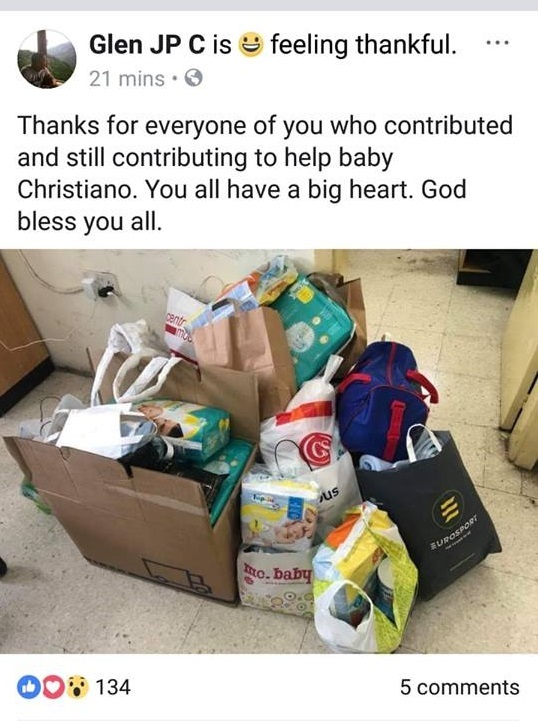 In a post on social media the Sergeant expressed his appreciation to those who had gone to Qawra Police Station to donate clothing and other items needed by newborns.